How can we consciously harness the power of the diaphragm for breathing, movement and daily living? What does it feel like to develop our inner sensing ability around the movements of the diaphragm? How will diaphragmatic accessibility change my relationship to movement? It is important to visualize the movement of the diaphragm so that it can inform our breathing. The diaphragm looks like a parachute. When we understand the shape and movements that the diaphragm performs, we can begin the quest to consciously support all of it’s functions. First, let’s explore the shape. 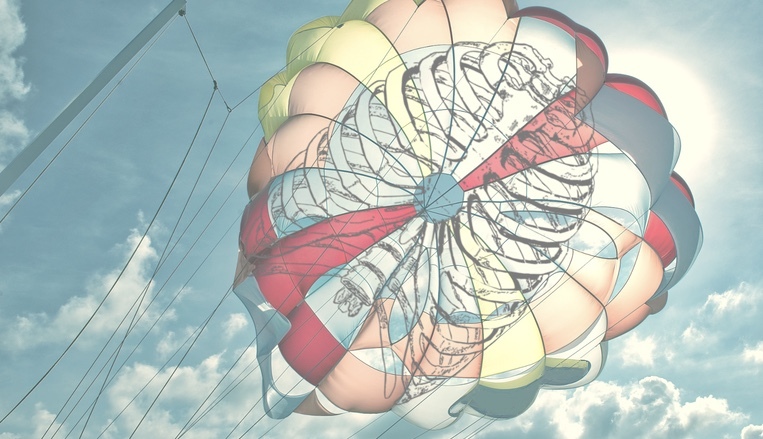 Imagine a parachute, the edges of which are sewn into the lowest ridge of your rib basket. The rib basket wraps around your whole torso, so does the diaphragm. The obvious movement of the diaphragm is that is flattens like a pancake when we inhale and domes up like a parachute when we exhale. The less obvious movement of the diaphragm can be seen when we imagine pouring syrup on a table. When it hits the table, the syrup will ooze out in all directions. Now visualize a video or a meme of this syrup pouring out onto the table, then press pause and rewind to watch the syrup gather and lift back up. Then replay the sequence in your mind a couple of times to visualize the diaphragm behaving like the parachute and the syrup simultaneously. This imagery shows us that the rib basket needs to expand in all dimensions in order to support the lungs in meeting their full capacity. When visualizing the movements of the diaphragm, we are invited to experience both where we move with ease and where we have blockage, restriction or lack of movement. Understanding and feeling where we move or don’t move the diaphragm helps us to build a conscious relationship with the Breath. It also provides us with a successful tool in life, in movement, in intense emotion or any other moment when our breath is unconsciously changed. Anatomically, there are many organs dependent upon the successful movement of the diaphragm. The most obvious are the lungs. The lungs and the diaphragm are connected fascially, mechanically and functionally. With Fascia the lungs are physically anchored to the diaphragm via the pleura. Mechanically, the movement of the diaphragm expands and contracts the lung tissue during inhalation and exhalation. Functionally, the negative pressure of the thoracic cavity combined with the movement of the ribs and diaphragm invites the dimensional expansion of lung tissue. If the diaphragm is contracted or adhered to the walls of the rib basket then the capacity and functionality of the lungs are compromised. The heart is directly attached to the diaphragm via the pericardium. If the average person displaced their diaphragm about 3 inches with every breath, then the heart is similarly moving with each respiration. This is a vital function for the movement of the blood and the health of the heart. In fact, functionality is often tethered to movement. Our vital organs depend on that movement to operate at its highest frequency. The heart is one of the most vital. The diaphragmatic movement is usually tied to pulmonary function. The heart and the lungs are integral to each other’s survival. Our vitality is dependent upon our breath and the movement of that blood throughout the body. The diaphragm is a key muscle in the movement of the heart and vascular system within the body. The heart and the blood depend on the breath to aid in the strenuous role of pumping fluids in and around our body. The kidneys have ligaments and fascia hammocks that directly connect to the diaphragm. Healthy diaphragmatic movement results in the kidneys traveling about 1/4 mile per day. This movement plays an important role in the kidneys ability to filter and cleanse the blood. Likewise the liver depends on the movement of the diaphragm. It rolls anterior and posteriorly. This movement helps shift the blood around and through the liver helping it to detoxify the organ and thus the body. The stomach, spleen and pancreas also hang from the diaphragm and the movement likewise aids in their functionality. It helps in digesting food, the secretion of hormones and enzymes, the growth of immune cells and much more. Movement is the source of life and the diaphragm supports all of these vital organs/functions with a steady flow. It is in our best interest to consciously support the diaphragm with awareness and differentiation. The more consciously capable we are in moving the diaphragm and how free the muscle is from surrounding structures, the more function it can be in transferring its movement to our vital organs. This in turn keeps the body functioning at its highest frequency. By understanding the shape of our body, the better we are able to sense and feel ourselves. The more we can sense and feel our body, the more we can recognize and know when it is in need of our help. We can help the Body by supporting its natural movements and differentiating stuck structures thus supporting their functionality. Developing a clear relationship with your diaphragm can be life changing and absolutely necessary to supporting your bodies own healing potential as well as accessing our highest frequency.